Start Losing The Fat Now! Today, Organic Coconut Oil in capsules has become very popular on the market. Among many natural weight balance supplements, this product stands out for a very good reason. The fact is that coconut oil contains a unique combination of valuable saturated fatty acids that have excellent healing properties and have a profound positive effect on your metabolism. From a chemical point of view, Coconut oil is the leader in the content of the medium chain triglycerides (MCT). These MCT’s are metabolized differently in that they are transported straight directly into the liver from the digestive tract. There they are immediately used either for energy at or for converted into ketone bodies. The inscription on the product “Organic” means that the products during cultivation and manufacturing of which are not used synthetic mineral fertilizers, pesticides, growth regulators, artificial food additives, as well as genetically modified products. In the process of cultivation, only natural organic fertilizers are used, weeding is carried out only manually. To combat insect pests, only physical and biological methods are used – using light, noise, ultrasound, changing temperature regimes, various traps, etc. The products of ORGANIC are considered to be the cleanest, safest and most useful for health. “Extra Virgin” marking means that this oil is produced by the method of the first cold pressing, exclusively by mechanical means without the influence of chemical and biochemical solvents or high temperatures. After cleaning the pulp of the coconut from the husks, the pulp is pressed, squeezing out everything that can be squeezed. This is the first cold pressing, which results in a quality oil that has all the natural food properties of the raw materials. Organic coconut oil is available on the market in the form of a soft gel. Product manufactured at a registered FDA facility which is located in the USA. The manufacturing process complies with the GMP guidelines. Therefore, high product quality is guaranteed by the existing highest standards. It is an absolutely harmless food supplement based on proven natural ingredients without any side effects. That’s why Organic Coconut Oil is so good for health. The main component of pure coconut oil is lauric acid. Its amount exceeds 50% of the total composition of ingredients. In the process of digestion in the body, this acid turns into monolaurin which helps maintain a healthy metabolism. In addition, lauric acid very effectively helps to fight with various pathogenic viruses, fungi, and bacteria causing diseases such as herpes, influenza, cytomegalovirus and even HIV. Coconut oil also contains medium chain length triglycerides. These are good fatty acids that are rapidly metabolized and sent directly to the liver. There, triglycerides with medium chain length produce the so-called thermogenic effect, which can not only maintain but also improve metabolism. Therefore, you can gain more energy and reduce the accumulated fat in your body. Certified Organic by UDAF. Virgin Coconut Oil (VCO) from Vita Balance is certified as an organic product by the Utah Department of Agriculture and Food. Therefore, you can be sure that you are buying extra virgin organic coconut oil extracted by wet processing. Coconut oil is useful for maintaining the immune system. Antimicrobial lipids, lauric, capric and caprylic acids, which possess antifungal, antibacterial and antiviral properties, strengthen immunity. The human body converts lauric acid into monolaurin, which effectively fights against viruses, bacteria, including influenza, herpes and chronic stomach diseases (Helicobacter pylori), as well as protozoan parasites and listeria. That is, it can increase the level of body protection. In addition, lauric acid helps to accelerate the healing of skin lesions and activates skin regeneration. Obesity is one of the biggest problems related to human health. Very many people think that obesity is just a matter of the number of calories consumed. However, many serious scientists believe that the sources of these same calories are also important. The fact is that different products have different effects on our internal organs, as well as on the production of hormones. Triglycerides with a medium chain, which abounds in coconut oil, increase energy consumption, compared with long-chain fats, even if their caloric content is the same. One study showed that the consumption of 20-30 grams of triglycerides with an average chain per day increases daily energy consumption by 5%, which in physical terms is approximately 120 calories, that is, there is a “thermogenic” effect on the body. However, in order to take advantage of the thermogenic effect and less caloric content of coconut oil, you must replace other sources of fat with the same amount of this product. In the long run, this will help you to significantly reduce weight. One of the interesting features of coconut oil is that it can reduce the feeling of hunger. This is probably due to the fact that ketone bodies, which are formed when fatty acids are broken down in the human liver, have the effect of reducing appetite. A recent study found that subjects who ate larger amounts of medium-length triglycerides at breakfast consumed significantly fewer calories during lunchtime meals. If this method of nutrition is used for a long time, you can lose weight quickly and sustainably. This means that the fatty acids contained in coconut oil can significantly reduce the person’s appetite, which in turn will positively affect the process of weight normalization in the long run. Especially effective is coconut oil when it is necessary to remove abdominal fat or visceral fat, which accumulates on your belly tends in the abdominal cavity and tends to lodge itself around the internal organs. This is the most dangerous fat that contributes to the emergence and development of very many inflammations and diseases such as diabetes and cardiovascular diseases. 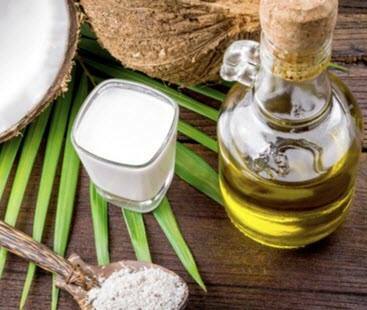 A study conducted with the participation of 40 women suffering from abdominal obesity showed that the inclusion of 30 ml of coconut oil in a daily diet leads, in 3 months, to a significant decrease in BMI (body mass index), having a profound effect on reducing the circumference of the waist and excess belly fat. Coconut oil successfully helps reduce low-density lipoprotein (LDL), called bad cholesterol, as it promotes the formation of cholesterol plaques that clog arteries and make them less flexible. Studies conducted on animals and on humans show that coconut oil does reduce risk factors for the onset and development of cardiovascular diseases. Also, scientists note that this product contributes to the improvement of clotting factors, and also improves antioxidant status. Studies have shown that coconut oil perfectly moisturizes the skin and increases the lipid content in it, and can also serve as an excellent means to protect the skin from sunlight, blocking about 20% of ultraviolet rays. In addition, this product can be very effective to protect the hair from damage. Coconut oil is used and as a mouthwash, killing harmful bacteria, improving dental health and eliminating bad breath. Limited time offer, buy 3 Coconut Oil Bottles and get 2 FREE!